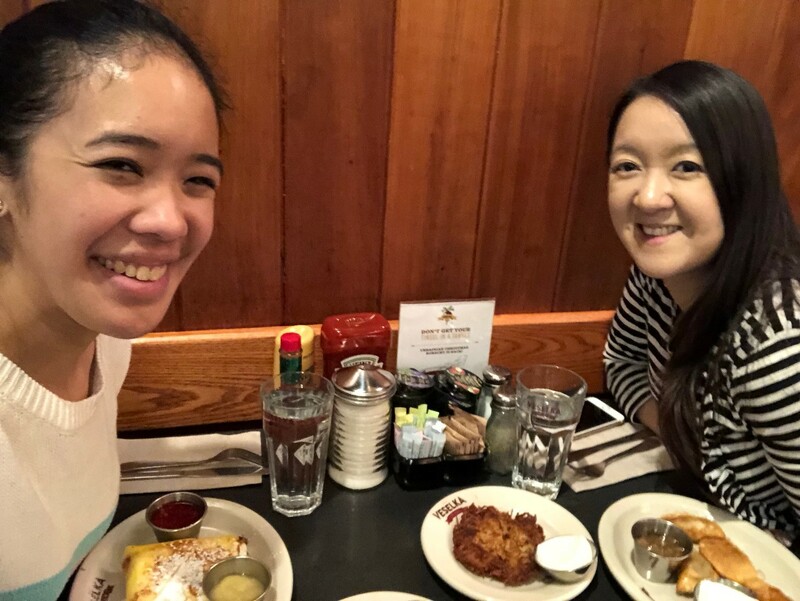 Rachel of Hello, Chelly and I have teamed up once more to bring you a collaboration that involves two of my favorite things - New York City and food. We're proud to introduce Table for Two, where the two of us will be highlighting restaurants and dessert spots in New York City. You'll be hearing our personal opinions on the place and the food, as well as finding out about where you can go to try it out for yourself! This month, I get to talk about Veselka (a dinner spot I adore!) and Rachel will give you the down low on ChikaLicious. The first time I ever visited Veselka was with my friend Lili, who had wanted to introduce me to the delights of this particular Ukranian diner. Suffice to say that I was really impressed, and have been back a couple of times since then to indulge my cravings. It was a random craving that inspired me to pick this restaurant to feature this month actually, as I just found myself thinking about how much I fancied pierogi on a random day at the office. Anyway, to cut the story short, after a month of not actually getting to hang out in person, Rachel & I met up for dinner on a random Tuesday evening. When you step inside Veselka, there is an instant atmosphere shift. It's comfortably crowded with tables, work stations and people (it's a pretty popular spot), and as a diner, it makes me feel cozy. There are a couple of smaller tables in the front, but towards the back, there is a wider space that accommodates larger tables for larger parties. I love the way that area looks, mostly because the wall decor is vibrant, colorful and adds a cheeriness to the vibe. Service is pretty efficient at Veselka and before you know it, you'll be seated, handed a menu and given sufficient time to contemplate before you place your order. On this visit, I decided to go with my old faithfuls - four pieces of pierogi (which you can choose the filling for, and I went with meat, cheese and truffle mushroom, and you can also pick whether to go with fried or steamed) and a single order of the blintz (which is a cheese-filled pastry I adore). Rachel also went for four pieces of pierogi (arugula and goat cheese, truffle mushroom, cheese and meat) and a single order of the potato panckage (which is another dish I love). The portions looked deceptively small when they were served, but we were the perfect level of full when we finished. 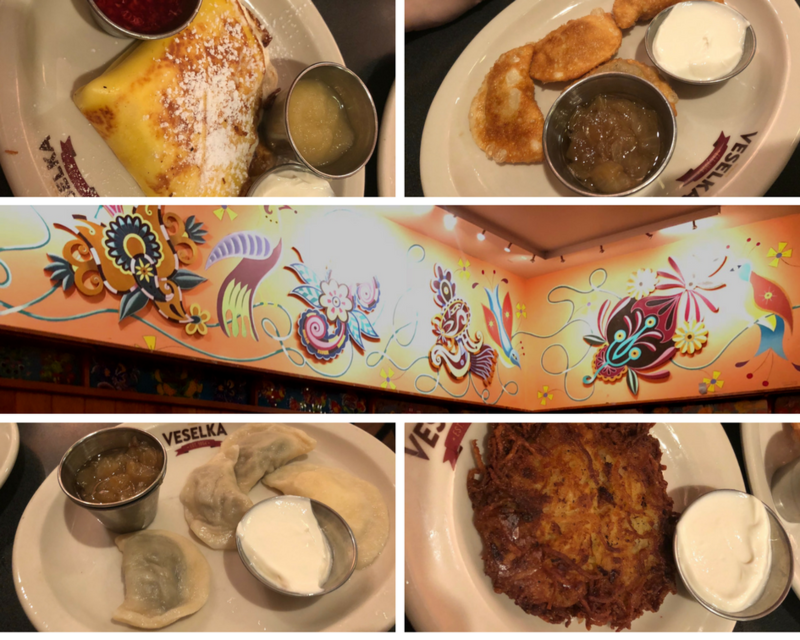 All in all, Veselka is a fun little spot to visit for some Ukranian comfort food. I have yet to try anything different on their menu (though I suppose I ought to), but these staples are well worth visiting for. You can find Veselka at 144 Second Ave, New York, NY 10003.